"FROM WONDER INTO WONDER EXPERIENCE OPENS"
The Museum of Jurassic Technology, located in Los Angeles, is a place that is easier to describe by its effect than by its content. According to Lawrence Weschler, who wrote about the museum in his highly acclaimed book Mr. Wilson's Cabinet of Wonder, a visit gives one a feeling of being "a bit out of order, all shards and powder." This reaction springs from two opposing impulses; the first is to trust that everything in the museum is true (since after all it is a museum) and the other is a gnawing feeling that something doesn't seem quite right. The best reason for trusting the latter impulse is that most of the collection is, to varying degrees, false. To be specific, the museum consists of dioramas revealing different aspects of "life in the Lower Jurassic," including some that are completely made up (a series on the life and theories of a fictional psychologist), some that are made up but believed true (a series on common superstitions), some that are true but unremarkable (a series on the European mole and the night flying moth), and a few that are both true and remarkable (a series on tiny carvings that fit into the eye of a needle). Although there are no direct statements on the museum's walls which let the visitors in on the secret, the museum does have copies of Weschler's book available, so the extra confused and curious can discover the attraction's "true" nature. I was one of those who, after my first visit, purchased the book in the hopes that it would guide me out of my own confusion. It did, but it also left me repeating "of course" just as I do when I discover the solution to a riddle that seems simultaneously complicated and simple. There is something fishy about a museum with an oxymoron in its title. Yet to be perfectly honest, I never even considered this a problem because in my mind the term "museum" eclipsed any notion to question the words that followed. I assumed that there must be a special use of the term "Jurassic" which was unfamiliar to me, a use that allowed it to be appropriately paired with the term "technology." This tendency to ignore one's personal reasoning in favor of a greater authority is only partly a result of the respect we attribute to museums in general; it is even more a result of years of academic conditioning to accept that information offered from an acknowledged authority must be true, significant, reasonable, and, in some way, good for us. Everything in the museum seems designed to make us feel uncomfortable with this trust. 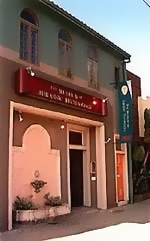 The Museum of Jurassic Technology in Los Angeles, California, is an educational institution dedicated to the advancement of knowledge and the public appreciation of the Lower Jurassic. Like a coat of two colors, the museum serves dual functions. On the one hand, the museum provides the academic community with a specialized repository of relics and artifacts from the Lower Jurassic, with an emphasis on those that demonstrate unusual or curious technological qualities. On the other hand, the museum serves the general public by providing the visitor a hands-on experience of "life in the Jurassic." The first thing that struck me was the strange use of the phrase "the Lower Jurassic." However, the claim that the museum serves the academic community led me to believe that there must be a new use of the phrase with which I was unfamiliar. I figured that if it were simply an error, someone long before would have informed the curator that he was confusing a term that describes an ancient time period for one that depicts a modern area. My inclination to trust was furthered by the second mission, to provide a "hands on experience" for the general public, which assured me that the museum was designed with models of effective learning in mind. The video goes on to describe the museum's place in the history of other such institutions, including what it claims to be the first natural history museum, Noah's Ark. This mixture of truth and legend is preparation for what lies in the main collection. The first exhibits one encounters after leaving the video room are a series of dioramas which focus on the life and theories of Geoffery Sonnabend. Don't bother looking him up, or you will end up just as frustrated as Weschler, who, after his first visit, looked for references to Sonnabend in several library databases, publishing houses and historical societies before realizing that he was chasing a phantom. Like Weschler, I fully believed that Sonnabend was a real person, partly because of the vast amount of details about his life and theories and partly because next to the dioramas of him is one of Marcel Proust tasting the tea soaked madeleine that invokes the memories of his childhood. My fondness for Proust increased my desire to learn about this more obscure theorist who also seemed to be interested in the nature of memory. All living things have a Cone of Obliscence by which the being experiences experience. This cone is sometimes also known as the Cone of True Memory (and occasionally the Characteristic Cone). Sonnabend speaks of this cone as if it were an organ like the pancreas or spleen and like these organs its shape and characteristics are unique to the individual and remain relatively consistent over time. This cone (occasionally referred to as a horn) is composed of two elements--the Atmonic Disc (or base of the cone) which Sonnabend described as "the field of immediate consciousness of an individual" and the hollows (or interior of the cone). A third implied element of the Characteristic Cone is the Spelean Axis, an imaginary line which passes through the cone and the center of the Atmonic Disc. Neither the explanation nor the equally obscure model that accompany it make any sense; however, both echo the rhetoric of academic discourse so well that I convinced myself that my confusion came from my inability to grasp the theory and not from the theory itself. In giving some of the parts different names, it seemed as if many other theorists had arrived at similar conclusions but quibbled with Sonnabend over terminology, and by using complex sounding terms with both certainty and consistency, I was inspired to trust those who were smart enough to invent and use this jargon. However, despite its impressive look, when summarized and translated into common usage, the whole theory boils down to an obvious point: events that effect us deeply are more likely to be remembered than those that are everyday occurrences. Perhaps if the theory were written out and I had more time to consider it, I might have arrived at this conclusion. However, the recording speeds past with no accompanying text except for the above model. This results in an effort of silent desperation to make sense of the whole thing, an effort which for me went something like this: Cone of Obliscence? I don't know this term but it sounds like it's related to "obsolescence," so I assume it has to do with memories we no longer need and discard into a what? Spelean Axis! This is completely unfamiliar, but maybe it only intersects the cone at an angle because most experiences are not kept with us as memories; perhaps that is why he calls this part "the Hollows" since these particular experiences do not have a lot of substance. Though the exhibit did nothing to enlighten my understanding of the nature of memory as a concept, it did inspire a few memories from my early undergraduate days when I would sit in lecture halls and listen to a professor pontificate through jargon, graphs, models and theories which I did not understand but which I assumed made sense to those who were smart enough to use them. Everybody there was taking notes furiously, as if this were all on the level and was likely to be on the test - the Falls, the cones, the planes, the whole thing, It was amazing. And at one point I leaned over to Diana [David Wilson's wife] and whispered, "This is the most incredible piece of performance art I have ever seen." And she replied, "What makes you think it's performance? David believes all this stuff." Wilson's belief not withstanding, I know that many would consider it outrageous that he is passing off lies as truth in front of students who don't know any better. I wonder, however, if the content of most lectures today will seem equally outrageous in a few years to come. Consider that a student in the early 1950s could come out of a day at school believing that a person will never walk on the moon, that Columbus discovered America, and that the meaning of a literary text can be discovered through codes which are completely contained within the piece itself. Isn't it arrogant to believe that much of what currently gets taught won't seem just as ridiculous in the not too distant future? Wilson sees his museum as a filter through which layers of explanations become obscured, allowing us to acknowledge the mysterious nature of the subjects they attempt to explain. He states, "Certain aspects of this museum you can peel away very easily, but the reality behind, once you peel away those relatively easy layers, is more amazing still than anything those initial layers purport to be." In short, a large part of the Museum's purpose is to inspire the kind of confusion that leads to a healthy skepticism of institutional truths. For it's only when people question established knowledge that new ways of seeing the world can come into existence, or as Lao Tzu put it in the Tao Te Ching, "from wonder into wonder experience opens."